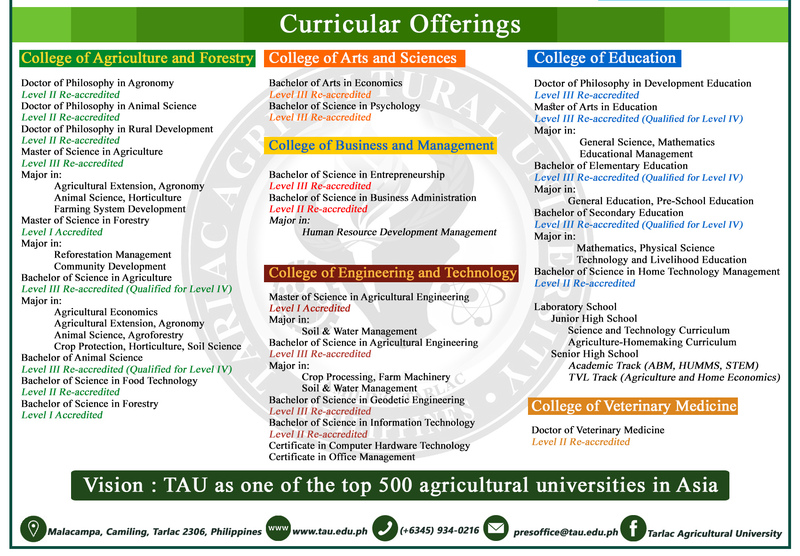 The Tarlac Agricultural University (TAU) kicked off its long term collaboration with the Israeli government through the conduct of training course on Gender, Climate Change, Sustainable Agriculture and Food Security: The Role of Agricultural SUCs in the Philippines in Leading the Community held on Sept.5-16 at the University’s Farmers’ Training Center (FTC). Initiated by CHED and the Center for International Cooperation of Israel (MASHAV), the training course aimed to provide the participants with the awareness and in-depth orientation on the interplay of gender, climate change, sustainable agriculture and food security; create a venue among the SUCs to frame institutional policies and innovative programs to mitigate climate change, promote sustainable agriculture and ensure food security; recognize government initiatives and identify possible prospects for generating support/assistance. Various representatives from different academic institutions and government agencies took part in the two-week long course which tackled topics that will improve the institutional capacity of the SUCs to provide the leadership role in the country on gender, climate change, sustainable agriculture and food security. Dr. Yolanda S. Guillermo, TAU Director for Extension and Training who served as training coordinator said that the MASHAV training was part of the pilot “Development of an International Agrotechnology Lighthouse (DIAL) Program” project to establish a long term-collaboration among Israel government, CHED and TAU in an effort to share knowledge and skills that would promote agricultural sustainability in the Philippines. She said that the training course gave an opportunity for the participants to discover necessary knowledge, skills and opportunities that exist in the country’s agricultural sector through the provision of technical assistance for farm development and diversification of farming systems and interventions for improved plant materials to guarantee quality yield. It also tackled gender issues and women’s role in achieving agricultural sustainability. Ms. Amy Oppenheimer-Abitbol and Mr. Jeremy Ben-Shalom, both experts from MASHAV, served as trainors and speakers for the said course. Aside from the training courses conducted, participants were also treated to some study tours including a visit to Sen. Cynthia Villar’s Social Institute of Poverty Alleviation and Governance (Villar SIPAG) at San Jose del Monte City, Bulacan. Meanwhile, Israel’s ambassador to the Philippines Effie (Ephraim) Ben Matityau graced the culminating activity of the said 14-day training course. In his message, the Ambassador explained to the attendees the strong friendship between Israel and Philippines, dating back to the sheltering of Jewish refugees from before the founding of Israel in 1948. “Israel and Philippines have so many things in common. We both have something common to be cherished, in terms of culture,” he shared. He also opined that the MASHAV training conducted at TAU was very timely as promoting Israeli techniques require sharing of knowledge and building local capacity. “In technology transfer, a foundation for capacity-building is needed, which means that Filipinos can absorb the technology, and understand the technology, and maximize their benefits. Through the conduct of trainings such as this, we can achieve these objectives,” said Mr. Matityau. Dr. Ruperto S. Sangalang, CHED commissioner, delivered a brief lecture on the specific role of SUCs in promoting sustainable agriculture. Also present during the closing program were Atty. Lily Freida C. Milla and Atty. Carmelita Y. Sison, CHED directors for International Affairs and Legal & Legislative Service, respectively.